Every year about this time, I make a small photo album or scrapbook page with my Stamp Club members. Many people get together with friends and families over Thanksgiving so it's always nice to have something to put a few favorite photos in. This past Saturday when my clubs met, we made these cute little photo "wallets". While the ladies were here, they started thinking of all kinds of ways to alter them to use them for gift cards or even to give money in. I love it when my very creative clubbers take a project and find great new ways to use it! The picture above shows the "wallet" closed. The one to the right shows it open. 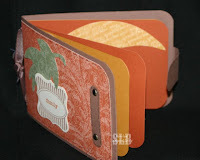 All products from Stampin' Up! I've been busy getting ready for a scrapbooking retreat that I'll be attending this weekend. I printed over 350 photos this past weekend and have been doing some power planning of scrapbook pages. I hope to get a lot done. I have so many great trips to scrapbook from this past year. In the past year, we went to Walt Disney World (once as a family and I went once with a friend), Yosemite National Park, Washington state where we went to Mt. Rainier National Park and Friday Harbor for whale watching, Glacier National Park, and Utah (twice) where we went to Capitol Reef National Park, Bryce Canyon, Zion Canyon, Arches National Park, and Canyonlands National Park! Looking through the photos I'm just amazed at this beautiful earth that we live in. We are so lucky to have such wonderful places to visit. I urge you to make plans to visit a National Park soon!